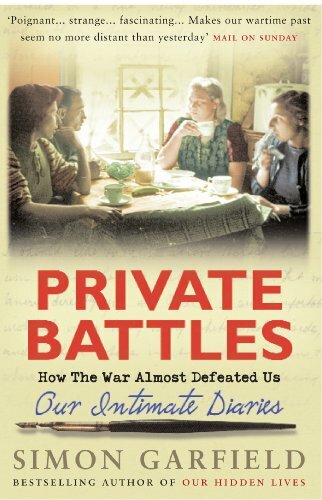 In Private Battles, award-winning writer Simon Garfield has skilfully interwoven the diaries of four ordinary people as they struggle to cope with the day-to-day reality of life during the Second World War. Edward Stebbing, a 20-year-old discharged soldier living with a stern landlady in Essex. In Private Battles, award-winning writer Simon Garfield has skilfully interwoven the diaries of four ordinary people as they struggle to cope with the day-to-day reality of life during the Second World War. Their voices combine to create one of the most compelling and refreshing takes on the period ever published. Meet Maggie Joy Blunt, a perceptive but frustrated young writer living alone near Slough. Pam Ashford, a shipping clerk in Glasgow who writes of office life as if it were an episode of The Archers. Edward Stebbing, a 20-year-old discharged soldier living with a stern landlady in Essex. And Ernest Van Someren, a research chemist in Hertfordshire, father of two children and proposer of several unique scientific ways to beat the Nazis. Perhaps here, for the first time, is the true story of how the ordinary people of Britain won the Second World War. And of how we almost didn't.